Now that I knew that I wanted to concentrate on running 5km, I could start to search for a training plan. There is a myriad of options online and I basically just chose the one with the elements I liked. One of the main factors in the decision I made was the fact that it involved interval training. My partner plays Australian Rules Football in the winter (also known as AFL) which is a sport that interval training is great for. Since she was also going to do the training plan I thought that this one would be most beneficial. What stood out to me most when searching plans was the frequency of rest days. As mentioned I earlier blogs, I jumped in at the deep end once I started running regularly. Seeing these plans made it clear to me that I had been on a collision course for either burnout or injury. Since I have implemented these rest days, I always feel much more fresh and prepared for a run when I do go. I had already run 5km to start the week and kick-started the training two days later. It is a six week plan with the assumed goal being a 5km race at the end. 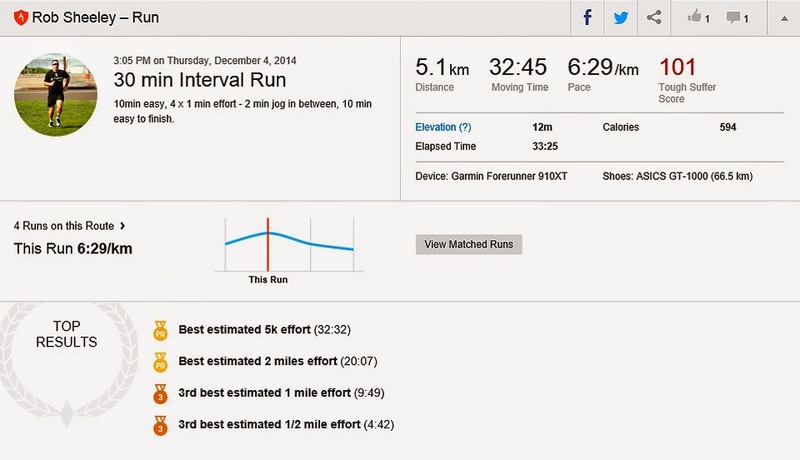 I have no plans for that race but am simply aiming towards being able to run a better 5km. The first week involved three easy runs between 20 and 30 minutes (Tuesday, Friday and Saturday) as well as a 30 minute run which involved interval running during the middle ten minutes. To date, it is the most kilometres I have racked up in a week (20.7km). I managed to improve my best 5km effort during that interval run to 32:32 which was over a minute better than the start of the week. I think the fact that I had incorporated two rest days into the week may have been a big reason for this, particularly after almost two weeks of wall-to-wall running in the lead up. The summary for the week was 2:21 running, 20.7km with an elevation gain of 48 metres.